at my local grocery store. Trolling Devon in Chicago turned up no celebrity-emblazoned packaging, but the IGA in walking distance from my house came through. Is SRK actually on Lux packaging or just in ads? Because I would love some SRK soap. any indian grocery store or some normal one? 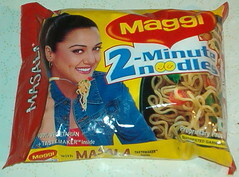 cool..that's one maggi i wont eat :-) SRK is on lux ads only, didn't see any packaging with him on it. You're in chicago .. I was there a year or so ago for a few weeks. commuting daily between Des Plaines and downtown chicago. Michael - a normal grocery store, believe it or not! It has a pretty big international section, but I was still surprised, especially after not finding any in the Indian neighborhood in Chicago. TCP - I'm not in Chicago (I'm 2 hours south, in Champaign-Urbana), but I visit frequently. I'm so sorry to hear about your commute! Yuck! What did you think of the city? I'm not sure people would be able to stand SRK on their soap packaging also. As it is, his bath-tub ad for Lux(don't know if you've seen it) is ugly enough! SRK on a soap will not sell soap. So no SRK on soap. But lots of SRK on TV. His latest ad is with Compaq. That is really sad about the soap. And I love the bathtub ad! Of course, I am not usually remotely swayed by Hollywood stars on products (although they don't seem to do that as much, at least not for stuff sold here), but there's something truly delightful in bumping into Preity at the grocery store. As it were. Something about the unexpected and the recognition - I was probably the only person in the store who knew she was a movie star and not just some chick with noodles. SRK is a chain-smoking, 5 foot nothing, hamming idiot who cheated on his wife with Juhi Chawla. They had a huge raging affair. How can you guys idolise actors so much? Falling in love with characters in films is fine but a person whom you've never met, whom you only now through publicity articles? That's really wierd. Get a life and idolise people for their ideals, not because they look good on screen! So, brave anonymous soul, you know of this heated affair through first-hand experience, then? There are plenty of people in my daily life that I hold dear for a variety of reasons, including their ideals. The movies are just for fun. You remember fun, right? Si - the IGA just off of Mattis. Go at once! I was there yesterday and they still had a few Preity packs. None at Am-Ko, though. Thanks, I found them :) I left a couple on the shelf for the next desperate Preity fan.